Recent studies have shown there’s a positive mental correlation between spending more time outdoors with a breeze on your face, versus having your face glued to a computer screen, as it seems is the increasing trend in today’s technological world. So here are a few inspiring items to help get you get started creating a new space with an outdoorsy feeling for your family, even if you are limited to a small patio space in an apartment or condo. This first article will tell you how to get started, then our second article next week will tell you how to light your new space to add some ambience and our last article in the series the week following, will show you some cool items to help you set the table outdoors. So for now, let’s get started! 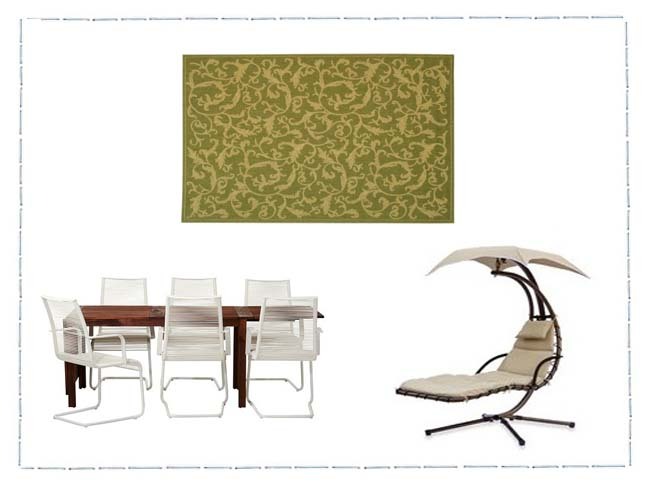 A great place to start creating your space is with an outdoor rug. These days there are a multitude of durable and well priced outdoor rugs like this one, that will create the perfect “anchor” for pulling together your new outdoor space. 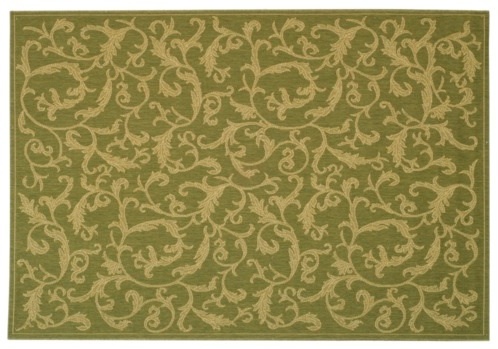 The green and beige tonal qualities of this cool patio rug are great, because it depicts a lush feeling of outdoor foliage and is available in various sizes to suit your individual needs. 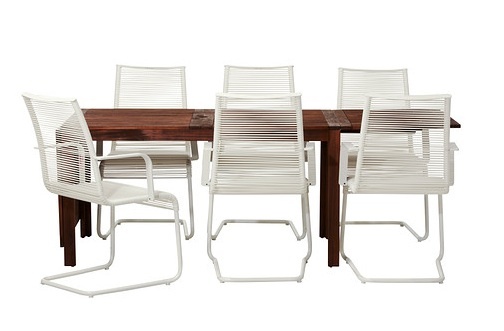 Next, if you have enough space available, add this stylish outdoor dining set, so that your family can experience the pleasures of dining outdoors, while sharing the details of their day. This set offers a drop leaf table, which makes it more adaptable for smaller spaces and it is really well priced too. If you don’t have enough room for a full dining set, don’t despair. 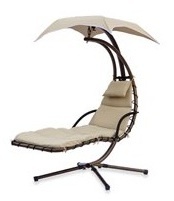 You can still create an inviting outdoor space with this dreamy chaise lounge which gives you the feeling of floating and even provides it’s own shade! What better place than this, to encourage you or your kids to grab a few minutes for a quick nap or to read that book you’ve been meaning to get caught up on? These are just a couple of ideas to get you started thinking how to create your new space, and in our second article in this series next week, we will give you some cool ideas on how to add lighting ambience to your new outdoor room. Stay tuned next week for part two.